This is one of the most unusual modifications we’ve ever covered. It’s also amongst the cheapest and (quite incredibly!) improves the fuel economy of the most economical production car ever sold. Understanding what the modification is and how it works takes some backgrounding, so hang on for the ride. 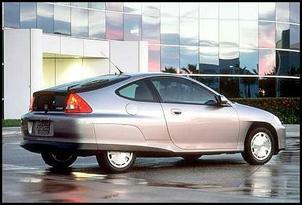 The Honda Insight – a hybrid petrol/electric car – is a fairly simple design. An electric motor is sandwiched between the 3 cylinder, 1-litre engine and the manual 5-speed gearbox. The electric motor, working with a small nickel metal hydride battery pack, provides assist and regenerative braking. Electric assist is added when the driver pushes down on the throttle, while regen braking is activated when the driver lifts the throttle and/or applies the brakes. So unlike the much more complex Toyota Prius, the gearbox and general arrangement of the driveline are quite conventional. However, the advantages the Insight has over the Prius include a slipperier, lighter body (all-aluminium but only two seats) and a much better engine. The Insight, unlike the Prius, also has a lean cruise mode. In this mode, the air/fuel ratio goes leaner than the stoichiometric 14.7:1 that the Prius runs all the time. In addition, the Insight can also switch out of closed loop, running rich air/fuel ratios of around 12.5:1 under full throttle at high revs. Despite plenty of tech information on the Insight being available on the web, it appears no one has ever directly measured air/fuel ratios and then posted the data. I used a professional MoTeC air/fuel ratio meter to determine the above information – that the Insight runs in closed loop 14.7:1 (or around 14.7 – say 14.5 to 14.8) a lot of the time; that the air/fuel ratios go richer at high load/high rpm; and that lean cruise is significantly lean. Most cars that run lean cruise use an air/fuel ratio of about 16.5:1. (Incidentally, lean cruise is now outlawed for conventional new cars here in Australia because of the high NOx emissions that occur when running lean. Car companies used to configure lean cruise to come into action only at loads and speeds not achieved in the emissions test cycle. More on NOx in a minute.) Compared with stoichiometric (14.7:1), a 16.5:1 air/fuel ratio means that – all other things being equal – about 12 per cent less fuel is used. Tech resources on the Insight suggest that lean cruise air/fuel ratios can be as lean as 22:1. 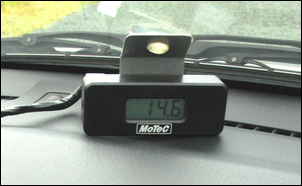 However, when I put the very accurate MoTeC meter on the Insight, the real story was revealed. Out onto the freeway and the air/fuel ratio stuck at 14.7:1. Then, after a few minutes of 110 km/h, the air/fuel ratio numbers started changing. At this point I exclaimed out loud – never had I seen such a lean air/fuel ratio on a running engine. Never. Then, a stunning twenty-five to one! That’s right, the Honda happily trundles down the highway with a measured air/fuel ratio of 25:1! To anyone with any knowledge of contemporary car tuning, that’s a jaw-dropping figure. In fact, perhaps more than any other readily observable characteristic of the Insight, the 25:1 lean cruise shows the brilliance of Honda’s engineers. But what about NOx emissions? To not exceed emissions, the Honda uses a special cat to store the oxides of nitrogen. The stored nasties are then ‘burnt off’ (the actual process much more complex than just simple combustion!) by momentarily running a richer mixture. 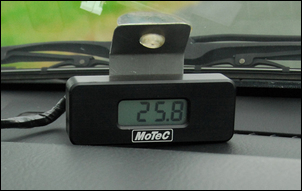 This process is crystal clear on the MoTeC air/fuel ratio meter. The car stays in 25:1 lean cruise for a while (or even, as the pic shows, closer to 26:1!! ), then periodically switches out of it, running 13.5:1 (ie slightly rich) air/fuel ratios for a short time before then returning to lean cruise. Trouble is, in standard form, any tiny twitch of the throttle by the driver will also drop the car out of lean cruise. It goes like this. You’re on the freeway, rolling along at 110 km/h. The road rises slightly and you put your foot down a tiny bit. There’s a jerk, some battery electric assist shows on the dashboard – and you’re immediately out of lean cruise, the air/fuel ratios dropping straight back to 14.7:1. The Honda does not use electronic throttle control. Instead, a conventional cable connects the accelerator pedal to the throttle blade. It was Lachlan Riddel of ChipTorque who made the suggestion. I had been talking to him about the Insight’s operating system and had suggested that I wanted the car to stay in lean cruise much more often that it did. I went through the options that had occurred to me – intercepting the (two!) oxygen sensor signals, disabling the oxy sensor feedback and controlling mixtures directly, and many other ideas. I also talked about tweaking the electric assist. Lachlan leant back in his chair and cut straight through to the fundamental. “I think that you should intercept the throttle position sensor signal,” he said. What he meant was that if the car didn’t see sudden throttle movements, it might stay longer in lean cruise. I went away very thoughtful – and did some testing. Watching the MoTeC meter and driving the car clearly showed it was definitely the rate of throttle change (rather than absolute value of throttle position) that triggered the drop-out of lean cruise. 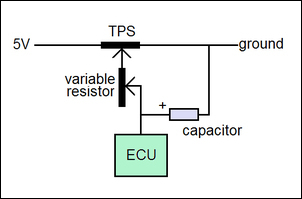 Smoothing of a signal can be achieved as easily as using just a resistor and a capacitor. 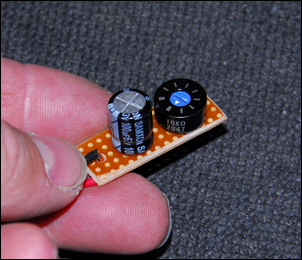 The resistor (as its name suggests) resists the flow of electricity, while the capacitor stores electricity. But what if we change the circuit a bit? 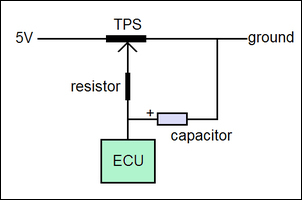 In this modified circuit, the capacitor stores electricity and so smooths the throttle fluctuations seen by the ECU. 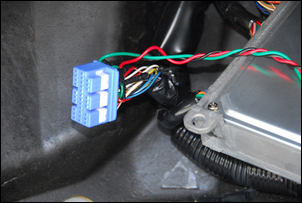 The resistor limits the speed at which the capacitor initially charges when the car is turned on and also partly isolates the ECU from the real signal. 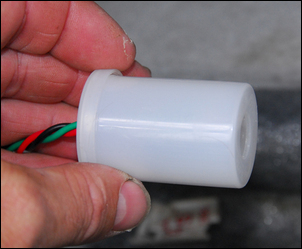 To tune the action of the filter, we can replace the resistor with a pot wired as a variable resistor. With this pot at one end of its travel, the TPS signal is unchanged. At the other end of its travel, the damping of the TPS signal is great – no matter what happens with throttle position, the signal to the ECU varies only very slowly. Setting the pot at ‘in-between’ values gives variable amounts of signal damping. After some experimentation, a 10 kilo-ohm pot and a 100uF capacitor were used. The cap must be rated for car voltage and note it is polarised – negative lead to ground. Here is a trace of voltage over time, recorded on a Fluke Scopemeter. 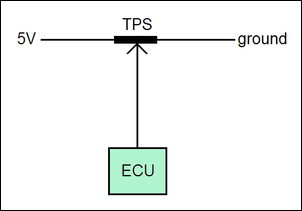 The bottom trace is the raw signal from the TPS; the top trace is what the ECU sees after the filtering. As can be seen, as far as the ECU is concerned, all throttle movements become smooth and gradual. Hey – instant ultra smooth driver! Highlighted here is an example of the throttle being abruptly closed. 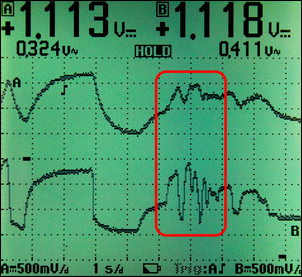 The bottom trace shows the voltage out of the TPS plunging vertically, while the top trace shows that after the filter, it takes about half a second to drop to the same level. Here the throttle has been rapidly moved up and down. The top trace shows how this has been smoothed. I set up the circuit and did some on-road testing. With the damping set to a high level, the car’s driving behaviour was clearly changed. Despite the fact that the throttle blade is manually controlled, high signal damping resulted in revs ‘hanging on’ when the throttle was lifted. (Presumably the idle speed control air bypass was delaying the decrease in revs.) High damping also resulted in rather lethargic throttle response. However, the car drove far more smoothly, without the standard little jumps as the electric assist and regen braking occurred. With the damping set to a medium level, the car drove more smoothly that standard, with few downsides. In fact, if anything it felt like it had a larger engine. Plonk the throttle down and the electric assist came on smoothly and progressively, while lift off abruptly and there was a pause before regen braking again came on smoothly. This latter point – a slightly delayed regen braking on throttle lift – is quite advantageous as in normal traffic, it’s common to lift your foot and then want to almost immediately re-apply it. With the delay in regen braking, this sequence is smoother and likely to be more economical on fuel (as the car doesn’t slow as quickly – better to retain the forward motion rather than charge the HV battery). No ECU fault codes were logged with the filter in place. With medium TPS damping, the car certainly drove better than standard. But would it also stay longer in lean cruise mode – the whole point of the modification? The short answer is: yes it did. 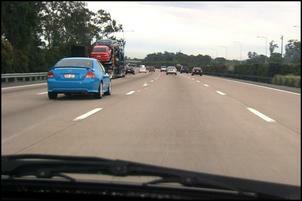 Testing the fuel economy of cars like the Insight and the Prius is very difficult to do accurately. My test is confined to open road fuel economy and is conducted on the mostly flat freeway between the Gold Coast and Brisbane in Queensland, Australia. In the past I have driven from Oxenford to Brisbane Airport every day for about four weeks, recording the fuel consumption each day (see My Commute). Typically I got a displayed economy of 2.9 litres/100km for the one-way trip. The best ever was 2.8, the worst about 3.0 litres/100km. On a similar but longer drive, (eg to the north of Brisbane, some urban running and then return to Oxenford) I normally achieve 3.1 – 3.2 litres/100km. Note that these drives are always completed running at the speed of the other traffic (110 on one section of freeway, 100 on another, and then 80 – 90 for some sections of congestion, then often a section of heavy congestion at 0 – 20 km/h.) The baseline is with the air conditioner not running. No special driving techniques are used – no pulse and glide, no in-neutral rolling, etc. In short, this is a normal, real world drive - not one where the car is dawdling along in the slow lane, or holding up other traffic through leisurely acceleration. Note that my Honda Insight has been fitted with a slightly revised intake system – see We Have a Record!. With the TPS smoothing circuit in place and MoTeC air/fuel ratio meter continuously displaying mixture strength, I hit the freeway. Immediately noticeable was that the car stayed in lean cruise mode far more of the time – slight rises in the road needing more throttle would previously have seen the car drop out of lean cruise, but now the car stayed at 25:1. Any larger movement of throttle (eg when swapping lanes to pass a truck) saw the mixtures return to stoichiometric, but in general the mixtures stayed in lean cruise - except when periodically doing the short-term rich mixture NOx burn-off. So what was the fuel economy like? Heading north, the displayed average started to drop, reaching 3.0 litres/100km and then decreasing to 2.9. It then dropped to 2.7 litres/100 – lower than I have ever seen on this part of the trip. (However, this day the car had a tail wind - nothing is ever simple!). I passed over the Gateway Bridge and then continued north, turning off the freeway at Bracken Ridge and then threading my way to Brendale. The average rose to 2.8 litres/100km. Without resetting the display, I then turned around and headed south. Across the Gateway Bridge section the traffic was stopped, so I was stuck in stationary and barely moving traffic for perhaps 25 minutes. (Note that the Insight cannot move on electric power alone, so when traffic is at a stop/start walking pace, it’s very bad for fuel economy.) On this leg of the journey I was also now pushing into a blustery headwind. The average fuel consumption rose to 2.9 litres/100km, a figure it stayed at all the way back to my starting point. So the recorded figure for 160-odd kilometre trip was 2.9 litres/100. The best I have ever previously seen for this type of journey is 3.1 litres/100km, so that’s an improvement of 6 per cent. The 2.7 litres/100km average part way through the trip is also the lowest I have ever seen on this road. As I said – it’s hard to accurately measure fuel economy when so little fuel is being used. However, in addition to the trip computer figure the best ever recorded, the conditions of the drive (winds and traffic congestion) were, if anything, conducive to poorer fuel economy than usual, not the best ever! So with the filtering in place, what happens to throttle response when you want to corner hard, adjusting the cornering attitude with the throttle? Interestingly, there’s not a lot of difference. Three things come into play here – firstly, the throttle blade movement itself is unchanged. Secondly, unless you’re a racing driver, it’s unlikely that you’ll be ‘steering’ with tiny movement of the throttle. Instead it’s more likely that you’ll be using large movements. Finally, the Insight is a car with little power, so to change the cornering attitude you tend to get heavily off the throttle or heavily onto the throttle. In a more powerful car – and perhaps with a better driver – these aspects might not apply. Would such a TPS filter work effectively on other cars? Most ECUs use TPS signals to work out rate of transient ignition advance, lean cruise activation (where it is fitted) and full-load fuel enrichment. In cars where the system is calibrated to be very responsive, filtering the TPS may reduce fuel consumption by smoothing the driving. However, it may also make the car a dog to drive. Fitting such a system (two would probably be needed) to a car with electronic throttle control could be very interesting indeed, but may also have a myriad of other issues including triggering fault codes. Considering the cost (a few dollars), ease of fitment, ability to easily tune the effect, and improved fuel economy and driveability, the TPS filter is a brilliantly effective modification of the Insight.